The structure of Rombes’ novel seems simple. Two men sit in a room. One describes short films while the other provides a kind of exposition in between film synopses. Yet there is something that occurs between Laing’s viewings of the films and his attempt to represent them to the narrator, something so much like what he describes as “something there, in between the frames, something that wasn’t quite an image and wasn’t quite a sound.” What we get is not a film, but not quite text: a description of an image that does not exist. Rombes cultivates a sense of dread so carefully throughout this novel that at a certain point it began to seep out into my reality. Is Blue Velvet even a real movie, I caught myself asking. Even my own memory of the film couldn’t be trusted, it seemed. What I’m trying to get at here is that the tone of The Absolution of Roberto Acestes Laing, its creeping dread, is totally dependent on the fictionality of the films themselves. Because these films don’t exist, Rombes can draw common symbols through them, like the red lines that disrupt the images and sometimes seem to be part of the films’ narratives and at other points seem to be mere faults of the film reel. The (nearly sacred) mysteries that lurk within these films can’t be represented by Laing’s narration of them, no matter how he tries; still, the real-world mysteries, such as the death of the narrator’s daughter Emily or the missing children on the posters around town, pale in comparison to Laing’s intense recitations. Rombes’ novel bears similarities to Marisha Pessl’s 2013 Night Film, another novel that focuses on muddling the distinction between film and reality. In contrast with Pessl’s expansive thriller, however, The Absolution is stripped to the bones of an encounter between two men in a motel room, talking. There is little emphasis on any technology other than the filmic: no status updates, no media inserts, no Easter eggs. (Rombes’ unnamed narrator is also significantly less insufferable than Scott McGrath, although perhaps that’s only because due to the constraints of the novel, he isn’t given a chance to be.) Yet for all their differences, like Night Film, The Absolution of Roberto Acestes Laing lingers over the horror it finds in the overlap of fiction and truth, most present in these fictional films that populate the narrative. Sure, two novels over the course of two years does not a trend make. This coincidence might be more along the lines of what one commenter called “tapping the zeitgeist.” In an era where we are increasingly concerned about efficacy of documentary technologies’ capacity for truth, it makes sense that the stories we tell ourselves might be concerned with the horror of too much truth, or of truth stripped bare. The images in contemporary media that show us truth in the way Laing means, the truth that cannot be seen and survived whole, are the kinds of images that betray our belief in the ability of photographic evidence to enact change or demand justice. 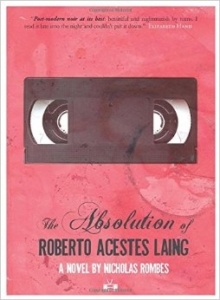 Night Film and The Absolution of Roberto Acestes Laing both possess the seductive lull of dangerous fiction, the soothing danger of madness as opposed to gloomy cynicism. Beautifully composed, chillingly paced, and formed of descriptions of films you want desperately to see even if you know they might drive you mad, The Absolution of Roberto Acestes Laing interweaves fiction and reality too tightly for comfort. But comfort is not what we came for, after all. Were we here for truth? Either way, as Rombes writes, we’re really in it now. Eleanor Gold is a graduate student who lives in Buffalo and is currently trying to turn her love of weird, squishy animals into an applicable methodology for cultural studies.